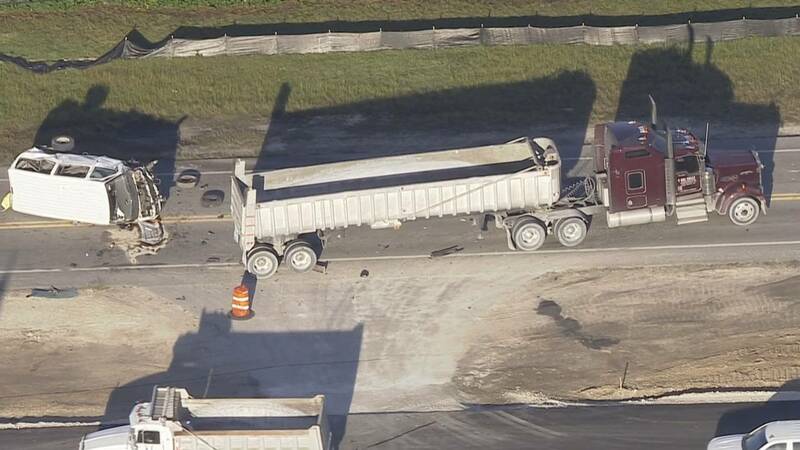 MIAMI-DADE COUNTY, Fla. - One person is dead and several others were injured Friday morning in a three-vehicle crash on Krome Avenue, according to the Florida Highway Patrol. The crash involved a van, a pickup truck and a tractor-trailer. FHP Lt. Alex Camacho said a pickup truck was traveling north on Krome Avenue when a van in front of it slowed down for traffic ahead. Camacho said the pickup truck slammed into the rear of the van, sending it into the southbound lanes, where it was struck by the tractor-trailer. Camacho said the pickup truck traveled off the roadway and struck a light pole. A man who was a passenger in the van was pronounced dead at the scene. Three other people in the van were taken to nearby hospitals. Miami-Dade Fire Rescue Lt. Kirsten Miller said two other people were treated at the scene. Krome Avenue was shut down between Southwest 200th Street and Southwest 216th Street during the investigation. It reopened Friday afternoon.